The Rabbi with a Blog (Rabbi Jason Miller): Hillel and Ludacris: Unlikely bedfellows! 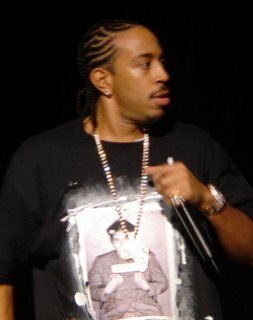 Hillel and Ludacris: Unlikely bedfellows! University of Michigan Hillel co-sponsored the Ludacris concert tonight. I think I am now deaf in both ears, but it was a fun event. I took my cousin Jeff Gudes and we watched from the 5th row with Jeff's sister Lindsey. Today was my grandfather David Gudes's 11th yahrzeit and I'm sure he enjoyed seeing three of his grandkids together at a concert, but most likely he had a problem with the music. "U-M Hillel has multiple agendas. One is obviously to serve the needs of the campus Jewish community by providing classes, kosher meals, religious services and Israel programming and counseling. Another is to enrich the life of the entire campus in much the same way that the 92nd Street Y in Manhattan sponsors a wide range of cultural programs that are of interest to a much broader New York audience than just the Jewish community in addition to their more traditional Jewish programming. In the past several years U-M Hillel has similarly brought to campus Chris Rock, Dr. Ruth, Kurt Vonnegut, Adam Sandler, Leonard Nimoy and Spike Lee among many others. On campus we also have a vested interest in building bridges to other communities and the Ludacris concert is very much in this category. It's probably true that few if any other Hillels in the country would regularly do programming like this, but in this respect U-M Hillel isn't like most other Hillels. If we were diverting resources from our core mission activities to sponsor programs like this we would not be doing it, but in fact we depend on the income from many of these large scale events to help fund other parts of our program. That the Michigan Student Assembly and the University Activities Center immediately came to Hillel to co-sponsor this event with them speaks volumes about the role that U-M Hillel has come to play in campus life and we believe that this is a good thing for both the university and the Jewish community." 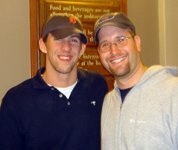 I also met Michael Phelps (winner of six gold and two bronze medals at the U.S. Olympics in swimming) before the concert. Another photo to post to my Wall of Fame.